Eiji Kisaragi (如月 影二) is an assassin ninja from the feared and respected Kisaragi clan. His school is the sworn enemy of both the Sakazaki clan and Kyokugenryu Karate. In The King of Fighters '95 Eiji decided to end the rivalry between his and the Sakazaki families by killing the Sakazaki Family (Ryo, Yuri and Takuma). Having traveled to Southtown to perform this task, he found no one in their dojo, instead there he learned of the King of Fighters tournament, in which the Sakazaki clan was participating. 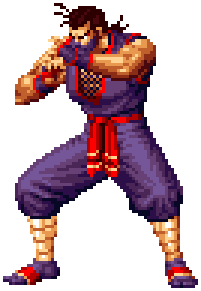 He also was hearing rumours spread town wide that Billy Kane, Geese Howard's former personal bodyguard was looking for some team-mates for his team for the next tournament. Eiji saw in this a perfect opportunity to fulfill his desire and joined Kane's team for the tournament. Eiji's team failed to reach the finals of the 1995 tournament and he was unable to get a 'clear shot' at the Sakazaki family. While about to escape and go search for them on his own, Iori Yagami appeared in front of Eiji and Billy Kane and brutally beat them, nearly killing them both. This page was last edited on 10 February 2018, at 06:15.